May 22, 2014：The French AMF has issued a warning about unauthorized forex brokers. BigOption.com is on that list. CLICK HERE to verify. September 2017: Lee Elbaz, the CEO of Yukom, has been arrested by the US FBI for wire fraud and conspiracy to commit wire fraud. Yukom is the parent company of BinaryBook and BigOption. CLICK HERE to confirm. June 2016: The Ontario Securities Commission has issued a warning against BigOption. CLICK HERE to verify. June 11, 2015: The Anguilla Financial Services Commission has issued an Investor Alert against Big Option. CLICK HERE to verify. Do not have anthing to do with them! I have been trying to withdraw my funds from Bigoptions since July 3 2018. My requests are acknowledged but no refund is forthcoming. They don't provide credit card withdrawals anymore, only wire transfers which require approval from their "finance department". I have reached the conclusion that they have no intention of refunding my money. They hope I will just give up. Hard to deal with this Bigoption. Asking for refund back my money via email but they seem to be ignored it. Dec 7, 2016 - 2 Stars Their Reputation still below PAR. Clients start showing unsatisfaction of their services. They even cannot send their representative to defend or answer their wrongdoing or by assuming nothing happen to them. Even I did send email to them that I want to closed my account and want to withdrawal my account balance 141USD but seem to be they felt reluctant to accept my request. Maybe they scared they might lost their customer? I was invited by my contact in Singapore to deposit in this option. Johnathan Copper called me later and explain there are hedge fund model which give 17% fixed monthly and trading model that can give up to 50% monthly. Needless to say they will always push for higher deposits. I choose the trading model and Roger Wilson attended to me. I tried with a 10k and got profits around 7k within a week, I also tested withdrawal of 1k and got the money to my credit card in 5 days. So as usual again, they push for me to get an VIP account, I topup 40k to expect VIP results. I have a few major lost of more than 30k, the trader then top up using bonus stating VIP have security. It continue to go down and I feel I should not trade with this brokerage anymore. I wanted a withdrawal also because I need to settle my credit card bill, but they delayed and give me so many excuses. Luckily I saw some comments online before saying the account manager will deliberate empty your account so I changed the password. Once they know I am going to withdraw, no support nor reply is given from them. 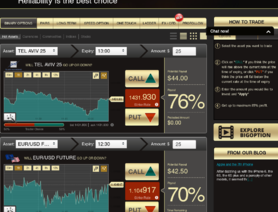 This is the worst binary option brokerage I came across and if anyone thinking of going in, think twice. Big Option? More like Big Mistake. You will figure that out when you want to withdraw. Hello everybody, I have read some reactions about fraudulous activities by Bigoption, and certainly by Peter Thomspon. I was 2 weeks ago also a victim of this criminal. He forfeited 8.500 usd with the laddersystem while he cancelled my withdrawal. Despite we had negociated the withdrawal approval on the Phone because I had reached my turrnover. The best thing that I could do is complainting by http://www.gmlitigationassistance.com/nl/index.html. This is a dutch site, but they offer also assistence in deutsch and French. I did it also. When we all, as victims of BigOption and, other victims you know, complaints by this organisation, there will be a very big chance they will open an investigation. We can easilly find at least 10 victims, enough for this organisation to open an investigation. There are offering juridical assistence, so we can devide the costs between the victims. Please send me an email to chrisdecoster@telenet.be to get more information, please don't hesitate!!! Those criminals must be stopped.
! !DO NOT TRADE WITH BIGOPTION- FRAUDELEANT COMPANY- MANY BAD REVIEWS ONLINE- UNREGULATED-USING ROGUE AGGRESSIVE AGENTS!! On 16/5/2015: I signed up with BigOption ACC #335375 which is registered a trading business registered by a company called BIG MARKETS MU LTD located in the UK/England. On 19/5/2015: I requested the withdrawal of my funds after reading some bad reviews and practises by BigOption. On 19/5/2015: I received an acknowledgement of my withdrawal request and was told that I required to speak to someone before the withdrawal could be authorised. On 20/5/2015: I received a call from Jerry Gallo who talked me into placing 9 trades valued at US $250, luckily 8 trades were successful and I was in credit of approximately $229. Despite this, I requested a withdrawal of the remaining funds who stated that he required my PASSWORD in order to proceed with the withdrawal. He stated that I could only withdraw a minimum of $200 (US) and the withdrawal would take 48 hours to process. Bigoption require an authorisation form for their agents to place trades of behalf of their clients- I did not authorised this nor did I authorise for Jerry to do so. On 23/5/2015: I requested Bigoption to investigate this matter and filed a complaint. 26/5/2015: I received an email from Bigoption indicating that they had investigated the matter and “I have done the needful, the needful will be done to compensate you”. Despite this email on the 26/5/2015 stating that I would be compensated, I never receive the $200US from bigoption. On 3 or 4 occasions I was advised that the matter was still been investigated and on 2 different occasions stating that I will not be able to withdraw my funds I have $.25 left on my account?? It was illogical and unimaginable for me to have requested a $200 withdrawal one minute and then risk it all by placing one single trade for $200. 19/6/2015: last contact from Bigoption indicating that the matter was still been investigated. I contacted my Visa merchant who conducted an investigation into the matter- and thankfully was credited the $200 back into my account. Id like to say to Eric Martin- im sure the 12 reviews I have left regarding my experience about bigoption will cost your employer more than $200!! I came to BigOption via the German Binary SCAM Robot (33% winning ratio in my statistics, at least far from break even). Beeing a noob, I took the bonus and therefore locked my money. Anyways, at least I wasn't enough of a noob to loose it all, and having switched off the Robot, my account is slowly recovering now. Last week, the Robot activated itself again and placed 2 Trades on my behalf. Agent	Tue, 09/01/15 03:44:58 pm UTC	Hello SP. How may I help you? SP	03:46:02 pm I have 2 Trades in my account that I didn't open. I want to know if these come from the "German Binary Robot" and I want these Trades to be made undone asap! Agent	03:46:51 pm Please give me a moment while I locate your account in our database. SP	03:48:32 pm I deactivated it a year ago and changed my password! SP	03:48:41 pm Any other explanation? SP	03:49:00 pm WTF?! Stop working with these scammers!!!! SP	03:49:25 pm Can you please block this bot from my account? Can you confirm that they opened the trades? How can I make sure that they never open a trade in my name again? SP	03:58:32 pm Then one question remains: How did they gain access today? I didn't even log in for months. It was deactivated! I mean, if they did this today, why shouldn't it happen again in the future? SP	04:00:23 pm Ok great. I will send me this Chat transkript if I get any trouble in the future again. Last question: Any chance you cancel these 2 trades? Agent	04:01:10 pm Please hold on. SP	04:08:25 pm Hi! The German Binary Scambot activated itself today (I haven'T logged in with them for like 6 months!) and placed 2 Trades in my acount (end of day). I hate letting these run because I'm not a Gambler and I don't understand the logic behind these trades - in short: I wouldn'Ät have taken them. Any chance you cancel these? Agent	04:09:40 pm Kindly note that the trades can be sold. Agent	04:11:20 pm	You can wait that it expires. Ok. I was able to close it with an acceptable loss. Can you confirm that German Binary Robot is closed out from my account forever? Agent	04:17:07 pm Please hold on. Kindly note that it has been deactivated. It will not be placing trades on your behalf. So I'd rate the BigOption Support a very generous 3 Stars out 5 for their support, but then there is still this scambot. If I was the broker (assuming a serious one! ), I would have stopped making business with these Scammers immerdiately, blocking all access to my clients accounts, but the German Binary Robot is still around! More than that, I would bet my account on a CALL on the "BigOption and German Binary Robot" is run by the same people. I already did, however I can still login to my German Binary Robot account. I request you to delete this account as a confirmation that no trades will be placed in the future. If you ask me to contact the Broker to delete an account that is held by German Binary Robot, I must assume that BigOption and German Binary Robot are the same. 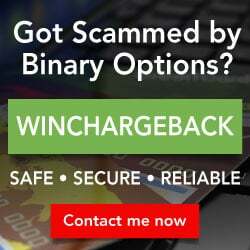 I have invested with Big Options, they had this thing called Binary Breaker Auto trading which I dint even know was related to this company, I wanted to find out if the software called Binary Reaper really works, than after I put $250 I saw that my account was getting too many loses, so I stopped the Auto trader, than a broker from Big Options called me (Kevin White) saying that he can trade for me and wanted me to put as much money as I can so which he said to me to put $15-$30k once he heard my credit limit. I said I will not do that, because I said I cannot trust him as yet, and that he needs to show me proof and proof himself to me first. After long talks almost for 2 weeks, eventually he agreed, than I only put $1000 than he started to trade and made a very small amount of money $200 est. but because the trades where long trades like 2-4 weeks apart, he kept calling me asking me for more money, and he kept saying that with such little money he cannot do anything, he said that there is a non -farm payroll news coming up, that I should not miss this blabla..he said that he will double my account in that news. So after sending me winning trades of other trades he did apparently, which I didn't believe but said...I am going to give you a go and put only $4000 extra. The first day I put the money he gambled and lost 6 trades out of 6 trades $2650 out of the $5000 USD. Earlier before he started to trade, he said he will make low risk trades. I also mentioned that he should not trade more than 10% of the total account! But he dint listen he just did his own thing without consulting me by breaking our agreement. I said to him to recover the $2650 and was complaining that he dint do what I said. He apologised saying that the hedging dint go well etc. I was very angry. Than he said the company agreed to give me the $2650 back as a bonus, which means he has to make $53,000 in order for me to withdraw the money, now I am totally stuck, I had to make a decision to either just to withdraw my $2350 USD or go by what Mr. Kevin White says. He promised me that he will be able to achieve the 53k within 6 months. He said he is very certain about it. It’s like he deliberately made sure I lose the money so that I can be stuck with these guys! How can a Broker lose 6 trades out of 6 trades and lose $2650 in one day!!!! I would have had much better chance by myself trading pushing buttons. How can a Company hire such a person who does not know what his doing!!!! So now, I said that he dint comply with the customer policy which was to stay within my guidelines, which was to invest only 10% of the account which he did it again and again afterwards he kept losing trades the account was as low as $2600 est waiting for expiry and the account now is at $4628.29 after winning and losing, but this took like 3 months or so. He was going to make the $53k in 6 months, but he kept losing. I complaint to the company but can't get true to the manager....it’s like they keep avoiding me. The Broker Kevin White is blaming me that it was my fault that I lost, because I stopped him from losing more of my borrowed money that I am paying interest on. I asked that I want my full refund and my whole account to be restored to full which is $5000, but no answer, they keep referring me back to Kevin White and he is playing games with me. So I send a request to withdraw at least the $4628.29 that is left no responds at all....!??? I can see that they cancelled my request to withdraw my account. They did not send me an email that it was cancelled nothing in writing. They most likely called, and dint even leave a message saying that it was cancelled. Kevin is making excuses saying that he tried to call and that I am not answering, I told him earlier to communicate everything in writing via Skype. He is being careful what he writes on Skype or emails. Now I am stuck, cant withdraw my money and this Broker Kevin White is no allowed to touch my account anymore I cancelled the agreement for him to trade for me. I don’t know what to do now.? I really need your HELP PLEASE to investigate and to see what we could do to get my money back?, as I have no clue how to handle this, DO NOT TRUST KEVIN WHITE FROM BIG OPTIONS!!!!!!!!!!!!!!! Or don't trust the company all together. They are liars, thief’s and I believe they are working together as a team, they are destroying lives out there. There is only $4628.29 USD left….which I want back. 1- He went against my will & Policy according to the agreement which states this in the agreement. 2- He invested over 10% which was our agreement before he invested. 3- How can a company employ a person who does not know how to trade? 6 out of 6 trades? Come on!!! 4- Why can’t I speak to the manager or any resolution officer?? 5- I am not satisfied with the performance or behaviour of Kevin White, accusing me of being mentally il! I made 2 withdrawals for my mom's hospital bill on last Monday 27 July 2015. My Expert Trader (Kevin White) from BigOption told me that he did some reserved trades with investment bank last week which could not be cancelled. It sounds like auto trade for 2 weeks long term. He said he reserved trades for Canadian and Oil. I negotiated him to withdraw $5,000 and it was success but I need to cancel another withdraw in order to cancel reserved trades he made. I think it is a big liar. After I cancelled my withdraw, kevin did some trades immediately on USDJPY and OIL and all trades got LOSS result for $17,500 in total just in an hour. (http://puu.sh/jeyMn/54657ac252.png) I changed my password and terminated expert trade contract immediately. I still have some money left in my account but only the bonus which I can't withdraw. The only way is to win trade until it exceeds the bonus level. I asked Support BigOption many questions but no respond. I got only email said that my case was escalated to that department or that manager and it's gone. Please see below questions I submitted to BigOption. 1. Can Expert trader reserve some trades in advance with investment bank for trader? 2. Do I need to cancel my withdraw request for cancellation reserved trades made by Expert trader? 3. Will Expert trader lose their license if their client loss money by his trade? 4. It is not allowed for client to see Expert trader's license or any identification document. 5. Expert trader gain 15% commission of client's profit on trade binary option and they will get it when client withdraw money. 6. Can Expert trader convince client to over investment and over trade? I also asked them about Platinum account privilege. It might be lucky that I just installed CallX mobile application which I have all sound records between Kenvin and me. I don't know whether who can explain how the credit card dispute process works. What can I do now? Please advise. BIGMARKETUM Ltd. The Apex, 2 Sheriffs Orchard, Coventry, West Midlands, CV1 3PP, United Kingdom. Big Option SCAM! They changed my password on my account & stole my profits!